Cells in our body work together and respond to changes in their environment. Many proteins are involved in transmitting signals within and between cells. Disruptions to this signalling is the cause of many diseases. 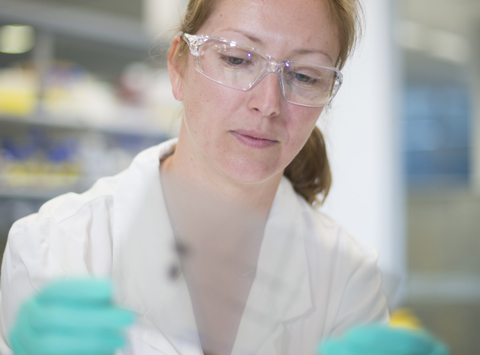 Our researchers are investigating cell signalling in healthy cells, to understand what goes wrong to cause disease. Investigating proteins that enable cell signalling, and how these signals are switched off. Defining the cell signalling pathways that trigger cell death and inflammation. Understanding how cell signalling pathways are subverted in diseases such as cancer, immune disorders and infections. 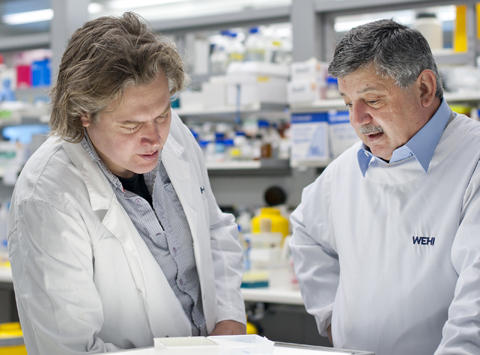 Developing new treatments for disease that target key signalling molecules. Our bodies are composed of billions of cells that work together. Each cell responds to external signals from other cells, and from its environment. Cell signalling refers to the translation of an external signal into a cell’s response. Direct contact with other cells or structures. Molecules that are secreted by other cells. Nutrients, toxins or other molecules present in the environment. Growing or dividing, or stopping division. Becoming activated to perform a specific function (e.g. to kill bacteria or infected cells). 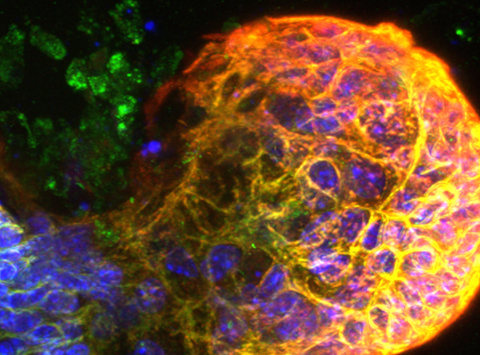 A particular signal may elicit different responses in different cell types. A cell’s response to a signal may also depend on other signals the cell receives, or has previously received. Most cell signalling relies on pathways of molecules signalling to each other to bring about a response. A ‘signalling cascade’ describes one molecule signalling to several molecules, which then signal to several more, and so on. This results in an amplified and complex response to one initial signal. Most external signals do not enter the cell themselves, but bind to the cell surface, usually via a protein called a receptor. These cell surface receptors often span the outer membrane of the cell. Receptors are specific for one, or a few substances, called ‘ligands’. When the receptor is bound by its specific ligand, it changes shape in a way that is transmits the signal across the cell membrane – like turning a key in a lock moves the latch on the other side of the door. Ligands are substances that specifically bind receptors. Many ligands are proteins, and fit precisely into specific receptors. Hormones and cytokines are common ligands for signalling between cells. When a ligand binds a receptor, it triggers changes within the cell that influence other signalling molecules. Many signalling pathways involve proteins called kinases. Kinases can exist in ‘on’ and ‘off’ states of activation. In some cases, a binding of a ligand to a receptor will switch on (activate) a kinase. When switched on, kinases attach a phosphate group onto other molecules, especially other proteins, changing how those proteins function. The proteins then have their own influences on other molecules. Many signalling pathways influence which genes are switched on in a cell. This effect can be mediated via changes to transcription factors, proteins that bind to specific DNA sequences in the genome. A transcription factor binding to a gene begins the process of copying it into its RNA form, allowing production of a particular protein. Many signalling pathways in humans involve specialised proteins. Cell death signalling pathways are an example of this. In apoptotic cell death, various cellular stresses or a specific ligand binding to a ‘death receptor’ trigger changes within the cell that activate caspases, proteins that demolish the cell in a tightly controlled way. Cells in our body are constantly barraged with different signals from their environment. These signals may be short-lived and change rapidly. Cells need to be able to switch off signalling pathways as rapidly as they were switched on. Proteins have evolved that act as feedback inhibitors and specifically terminate a cell signalling pathway. These proteins can switch off kinases or other signalling proteins, or initiate the destruction of proteins produced when the signalling pathway began. 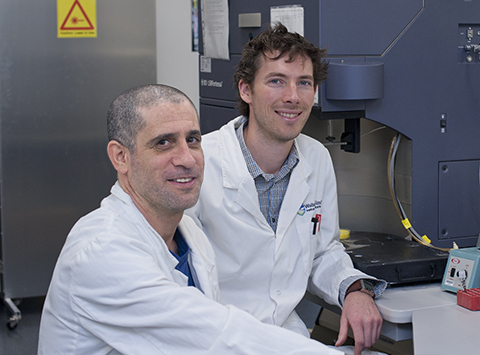 The SOCS protein family was discovered by our researchers. These proteins specifically turn off many different types of signals. Our research has demonstrated that in the immune system SOCS proteins are especially important at restraining inflammatory signals. Without SOCS proteins, inflammatory signalling is prolonged and can cause tissue damage. Cancer cells have constant activation of signalling pathways instructing the cells to grow and divide. This often occurs because of changes (mutations) in receptors, protein kinases or transcription factors that keep the proteins an active state. Some immunodeficiencies occur because immune cells lack the receptors for ligands that instruct immune cells to divide and develop, or lack the specific kinases that transmit these signals. Many viruses, such as hepatitis B, produce proteins that interfere with the host cell’s signalling pathways in ways that suppress the immune system and enhance viral reproduction. Cell signalling influences how cells behave in health and disease. Many medicines work by adjusting cell signalling pathways, often stifling a key signalling protein. Some treatments for disease work by preventing a ligand binding to its receptor. Medications that block cytokine signalling between immune cells are in clinical use to treat inflammatory conditions such as rheumatoid arthritis. 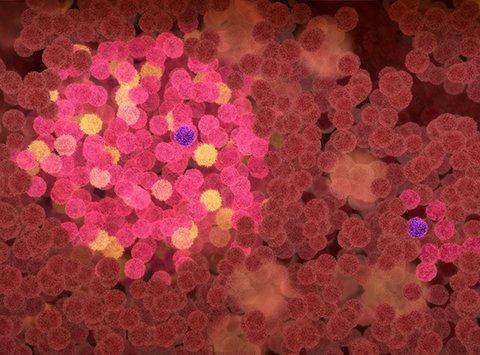 Many new anti-cancer therapies target kinases that give cancer cells the signals to divide. 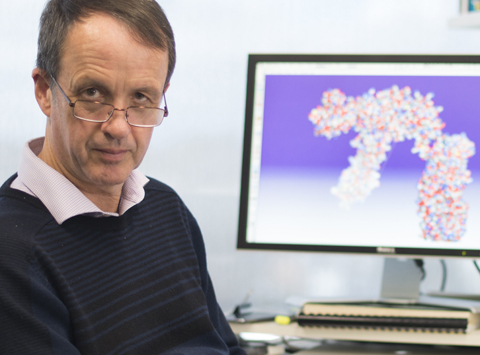 Our medicinal chemistry researchers are using three-dimensional structures of cell signalling proteins to develop small molecules that can specifically block the proteins’ function.